Ganashakti: Will Nepal be a Hindu State again? Will Nepal be a Hindu State again? 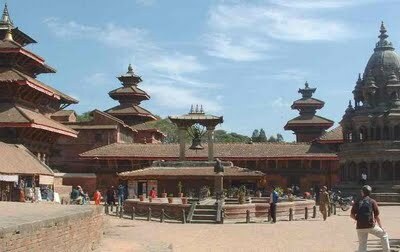 Nepal, one and only Hindu state across the globe even a few years back, is in a deep constitutional crisis these days and the rising turmoil along with adamant attitudes of Hindus there ascertain that consistent demands of various Hindu groups to restore Hindu State of Nepal may attain the objective. It is to be noted when only a few days are left to a constitutional crisis in Nepal Hindu groups have stepped up their demand for the reinstatement of a Hindu state. To make the movement more virile, protesters have called a national closure as part of their "Save the Cow" campaign. It is needless to say that cow is sanctified in Hinduism and hence, its slaughter remains proscribed in Nepal despite change in constitutional character. The Hindu kingdom became secular in 2006 following a massive countrywide pro-democracy movement. Whatever it is, cow is national animal in the Himalayan kingdom of Nepal. Only in the last week, World Hindu Federation (WHF), prominent Hindu group struggling for reinstatement of Hindu State of Nepal tooth and nail, arranged protest marches in Birgunj against continuing cow slaughters covertly, joined by hundreds of people. A new group called Independent Civil Traditional Youth Organisation Nepal has come to the fore. It has annunciated a national strike on upcoming May 27, 2011 and has asked people to observe the day as "The Holy Cow Preservation Day". As per the group, they would worship the cow in Lalitpur city, close to Katmandu, national capital, in public. Here are some more imperative facts. Hindu anger is growing up when on earth Nepal is proceeding fast to a constitutional deadline on May 28. Both parliament and government were supposed to state a new constitution publicly on that day. But both have already admitted they would not be competent to meet the deadline. 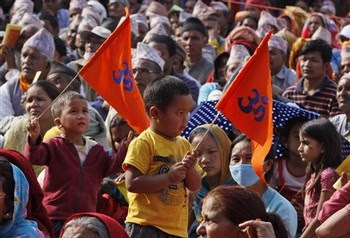 Considering the situation as a lifetime opportunity, an assortment of Nepali Hindu organizations have regenerated their hue and cry for a Hindu state. Rastriya Prajatantra Party-Nepal is the single party in parliament advocating the restoration of a Hindu state in conjunction with a Hindu king. The party also demands dissolution of the 601-seat parliament for its failure and annunciation of fresh elections to form a new house. King Gyanendra, erstwhile monarch of Nepal, is also in the clamor for a Hindu state and is learnt to seek advice from Hindu spiritual leaders.